You can peek beneath or behind nearly any object in my mother’s home, and you’ll find a little piece of masking tape with someone’s name written neatly across it. My mom loves organization. Keeping things orderly gives her a sense of peace and comfort. She also enjoys knowing that, when it’s her time to go, she is passing along the things she loves in an orderly fashion. 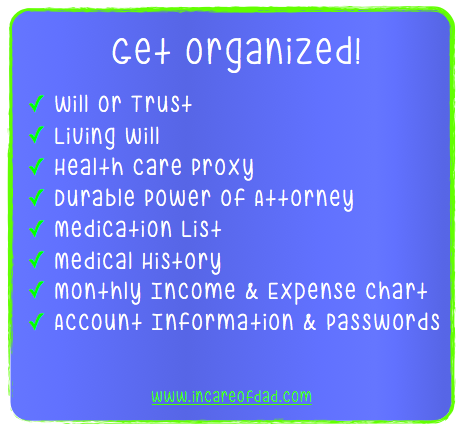 There is no doubt that my mother is the most organized person I’ve ever known, which I never truly appreciated until I finally saw the benefits during my father’s illness. Mom had everything about his medical history documented and easily accessible, chronicling his myriad medical procedures, treatments, medications, his family’s medical history, all the medical costs, and insurance information. We were dealing with so many different doctors that having his medical information at our fingertips was critical, and one of the ordeal’s few simple and straightforward exchanges of information. And then, of course, there was Mom’s unexpected stroke that she suffered several years ago. Karen and I were shocked because our mom was seemingly healthy, active and fit. For a period of time after the stroke, we needed to handle her finances, and it was such a welcome relief that all her pertinent data was in order and beautifully delineated. Instead of spending endless hours deciphering various forms and schedules and scraps of information, we could all relax in the knowledge that everything was under control and we could spend our time just being together. A Will or Trust that spells out the disposition of assets. A Will also addresses the guardianship of your minor children. A Living Will, including all Advance Directives, that lays out whatever medical treatments you would or wouldn’t want to keep you alive, and your wishes regarding pain management and organ donation. A Health Care Proxy that allows you to designate someone to make medical decisions for you when you’re unable to do so for yourself. A Durable Power of Attorney that allows whomever you designate to act on your behalf in any legal matter, if you are unable to make those decisions. A thorough Medication List that includes prescription drugs, over-the-counter drugs, vitamins and herbs. The dosage (e.g., 20 mg), instructions (e.g., take 2 pills each morning with food), the prescribing doctor, the reason for the drug (e.g., cholesterol, high blood pressure, etc. ), and the year prescribed. Note any allergies to medications as well. A Medical History that includes birth date, diagnosis, tests, procedures, treatments, and family’s medical history. We also included medical contact information for doctors and other medical professionals, as well as all insurance information. A Monthly Income & Expense Chart: My mom keeps a spiral notebook with a list of her monthly expenses and income, which includes all payment dates. She also notes expenses that she can deduct on her income tax. If you’re computer-savvy, consider using Quicken. Setting up direct deposit and automatic payment is a smart step, too. Account Information & Passwords. Include account information and passwords for banks, credit cards, and all service providers. Also include key information like your Social Security number. Consider having a lawyer handle the legal documents, such as a will/trust and durable power of attorney. If legalities don’t unnerve you, try using nolo.com, which is a respected online service. An easy and thorough way to work through preparing advanced directives, such as a living will and healthcare proxy, is by using Five Wishes, a non-profit service that makes this process easy and simple. Most financial information is sensitive, so you should keep it somewhere safe, but remember to clue in a few trusted people on where to find everything. Make a point of reviewing this information at least once a year. Does the thought of doing this overwhelm you? Then take it one step at time. This entry was posted on Sunday, July 27th, 2014 at 4:58 pm	and is filed under Advance Directives, Alzheimer's Disease, Be Proactive, Cancer, Emotional Support, Financial, Parkinson's Disease, Stroke, Uncategorized. You can follow any responses to this entry through the RSS 2.0 feed. You can leave a response, or trackback from your own site.